It's true that back in the day (my day) we spent a lot more time outside. In the summer months I spent some of that outdoor time sitting on blanket under a tree reading. It was too hot in the house back in the day before air conditioning. I read everything I could get my hands on. I didn't like everything I read, but reading did something--it took me away from the life I was living at that moment. I imagined my life substituted into the POV and became the proverbial "fly on the wall." I've been doing some introspection on just what is it I do. I was a teacher, even when I was in elementary school. My teachers always put me in charge of other kids, either reading to them or having me listen to them read. When I was just a kid in elementary school I went to a two-room church school and we had eight grades in those rooms. Instead of doing my school work in the class, I'd sit there listening to all the other classes and then take all of my classwork home. I was in second grade before the teacher finally figured out what I was doing. We prayed for missionaries and world leaders, other kids, our families and other items the teacher laid out for us, and one person we always included were the "colporters." All I knew about these colporters were that they were some sort of book missionary. They took books to people who might not know these books existed, and they introduced reading and books in faraway lands, too. I thought that would be the best job of all! One of the main reasons I became an elementary teacher was to work with students in reading. I taught children who had difficulty reading, children who were learning English as a second language and also worked with high school students who had difficulties with reading. I could think of no better mission in life. I am still influencing readers. I also read manuscripts for various reasons, but mainly to bring that manuscript to book form. (I hope.) And I still love books and bringing those books to readers who would like them. When I was teaching sixth grade, every day after lunch I'd have the kids relax while I read a chapter from a book I'd choose from the library. When we'd finish a book, I'd take them to the library and return the book I'd read. The librarian asked me one day, "What are you doing in that classroom? Kids are requesting the book you check out in droves! I can't keep up with them." Influencing readers is a great joy for me. The irony in all of this? My dad, who died back in 1999, was a functional illiterate. I did try helping him (he asked me to) and he was reading through the Bible (The Living Bible) when he died. My mom, an avid reader, had covered for him plenty, and he was so smart, he did what many people do when they have trouble reading--he compensated. This blog really isn't changing much. It still will encompass my passions. I'm a book scout, and whether the topic of conversation involves reading favorites, pointing out books, how to write books, or just what is IN the books, reading is fundamental to everything included here. Hope you will come back to share what you're reading, what you are writing, or simply to consider what is included here. I've always been a bird watcher, due to my mother's influence. We had tons of bird identification books and since I also loved to sketch, I drew tons of bird pictures. I can't keep descriptions or tie-ins with birds out of my fiction. It's as much a part of me as anything else. Plus, it keeps me tied to my mother, who died in 1997. So, I have been doing some more reading about birds and came across an obscure tidbit that Dante referred to Christ Jesus as "our pelican." That's weird! Have you ever seen a pelican? It is not exactly the kind of bird you depict Christ with. Ok, so then I came across more referrals to pelicans being the symbol of Jesus's resurrection. Certainly the Bible refers to birds often. The birds we most often think of are eagles and sparrows. But pelicans are often depicted on ecclesiastical coats of arms and in religious paintings. If you are an art lover, you will find them, so now you can notice them. And then there's the Mighty Dante talking about "Christ BEING our pelican." Why would he say that? 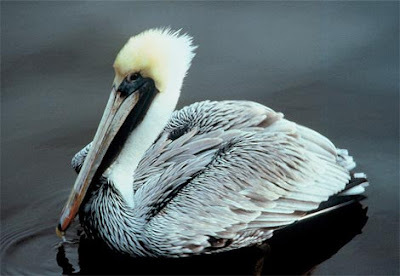 Here's the story: the name "pelican" comes from a Greek word for "axe." Because the pelican had a very large beak and uses it to fish, as well as in diving for fish,(using it like a net) their behavior was quite a picture for an observer. The pelican ejects the water and swallows the fish for its own nourishment .The pouch doesn't keep the fish for long, but during nesting season, it also becomes a "school" and place to feed the chicks. This next part is gross, but no one says that the story of the cross is pleasant, either. Pelicans also use that pouch to hold regurgitated fish soup to feed their chicks. The chicks have to DIVE into that pouch (their first lessons in survival) which is against the chest of the pelican. This is where the legends were born in observing this behavior.It must have been alarming to those who first witnessed this practice. Since the pelican will pluck the feathers from its own chest for the nest, it has a bloody chest during this time. In medieval religious folklore the pelican fed her young with her own blood, by plucking those feathers from her breast, and "reviving" the chicks after they drowned in the pelican's beak.It seems that those chicks were believed to drink the blood of the self-inflicted wound on the pelican's breast. It is certainly a painful process. In this story the chicks die (in the mouth/tomb of the parent) but are brought back to life (3-days later) by that self-inflicted wound on the chest, by allowing them to drink the parent pelican's blood. That correlation is how the pelican got into all those religious paintings, on family crests for Christian piety and into works by Dante. The pelican became a lesson, a symbol, for Christ's resurrection from the dead. That's some legend! And some picture. But it's not unusual for humans to use birds to teach us lessons about life. The pelican story illustrates one of the most awesome stories in human history. It takes faith for those chicks to dive into the mouth of a mother pelican for sustenance. It takes faith for one of us to believe that Jesus deliberately took the wounds inflicted to die on a despicable cross just to pay for our sins and revive us from eternal death. That was too much to ask, wasn't it? But not if you wanted survival of a species more than anything--and that pull was way stronger than Jesus wanting to save himself. Three days later Jesus would rise up from the dead and that was it! We were nourished for eternity. If you haven't embraced Jesus and his story, then think about how God gives lessons in the nature all around us. Remember the pelican today on Good Friday. And remember that God has lessons for you all around. The Bald Eagle was chosen for our national seal because of his power in flight, his longevity, and because the Bible mentions the eagle numerous times, including John who preached about its rebirth and power. It took from 1776 to 1782 to design the seal, and the founding fathers put a conciliatory olive branch in its right talon. This is a music video featuring a special free-flying Bald Eagle named 'Challenger' (in honor of the lost space shuttle crew) cared for by the non-profit American Eagle Foundation (AEF). He's a 'human socialized' bird raised by the people who rescued him when he was blown from a wild Louisiana nest in a storm as a baby in the late 1980s. Declared 'non-releasable' by federal and state wildlife authorities, he was trained by the AEF to perform educational free-flight demonstrations at high profile public events. He's the first Bald Eagle in U.S.history that learned to free-fly into stadiums, arenas and ballrooms during the singing of the Star Spangled Banner. The celebrity eagle has appeared at numerous major sporting events,like the World Series, Pro-Bowl, All-Star game, BCS National Championship, Fiesta Bowl and Men's Final Four, etc. Challenger has also flown before 4 U.S.Presidents. 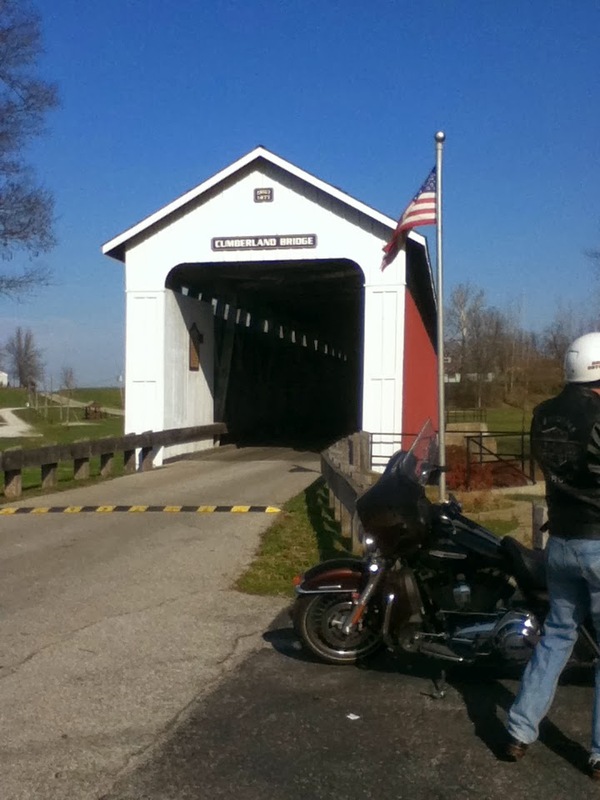 His life's story is told in a children's storybook titled Challenger, America's Eagle. It goes along with my own Christian faith on spiritual gifts--that God gives us gifts and we will feel joy as a Christian in using those gifts. So, it caused me to pray in more specific ways. And within 24 hours, I had opportunities AND a deep yearning to revive my own writing with new purpose. When you wrestle with the Lord (a reference here to Jacob,) then you must mark the ground as a place that is holy in your life. What is the most delightful (and there are several other things that came in) is I get to reconnect with those people who were part of my childhood and my own spiritual development. Maybe I'll get to talk about that. Anyway, I wanted you all to know that I so appreciated your warm comments and your prayers for me. It encouraged me. I hope that I can continue to encourage all of you, too. Do you know how it is when you've got lots and lots of people and things going on around you, but you feel desperately like you're out of place? I've been feeling that a lot lately. Like I shouldn't be here and maybe it was a big mistake to just keep hanging in there. And so sad that I am missing out on lives and things going on. And that I ache all the time for...something...not sure what! Ok, so I opened a vein here and while I don't know what the road is ahead of me, I took a snapshot of this one moment to remember. It's like a marker. 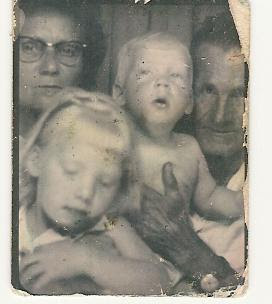 The above photo is of my grandparents, Roy and Pauline, and my brother and me. We went to one of those photo booths because they wanted photos of us and my parents wanted photos of them and they didn't have a camera. So they jammed into the booth and you can see the sadness on my grandparents' faces. Soon they would leaving to go back to Tennessee and we would be far away from them in Indiana. My grandparents had me for several years as their own, but then my mother got well and took me back--I don't think they ever thought that she would survive. It was a moment I would've forgotten if not for this photo that I have. Well, maybe I would have forgotten it. Maybe not. This is why I haven't posted lately. I really have been feeling out of place and like I have no purpose. I'm restless and anxious to get going. Just marking this place so I won't forget.